Warm oils poured directly onto your skin. 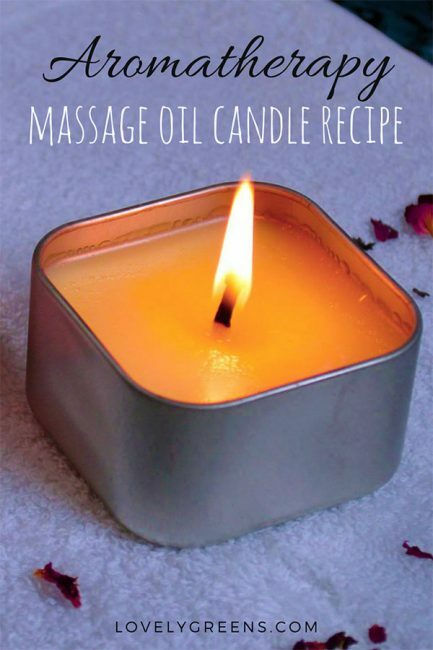 If you’ve not come across massage oil candles before, then you’re in for a treat. They’re romantic, all-natural, and easy to make yourself. Though they look like traditional candles, they’re actually a solid body oil blended with essential oils. Once lit, the oils melt at a warm temperature that can be poured directly into your hand and massaged into the skin. Pure bliss! 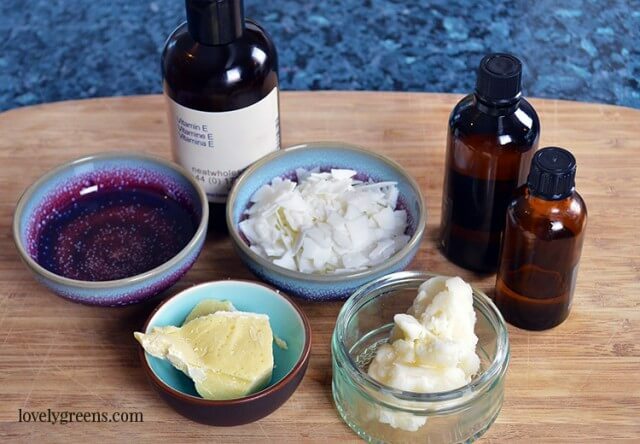 The tutorial below will take you through how to make massage oil candles and the links are there to help you find the right ingredients and materials. 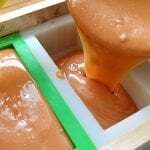 The process of making them is very quick – once all of your ingredients are assembled it’s literally a matter of minutes before your candles are poured. The video at the end shows you how it’s done and also gives a demo of how you’d pour the warm oil into your hand. 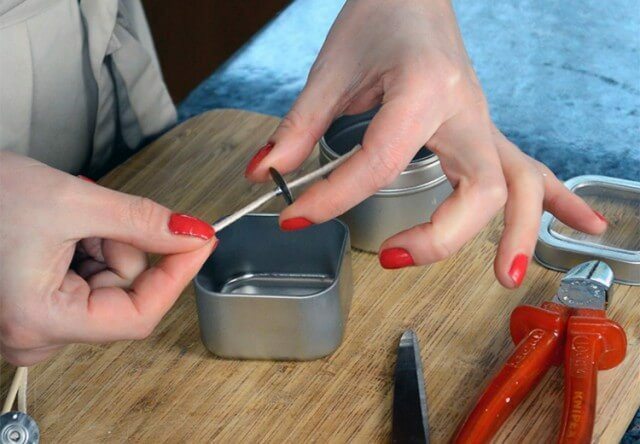 After they’ve set, you can decorate the tins and use the candles immediately. 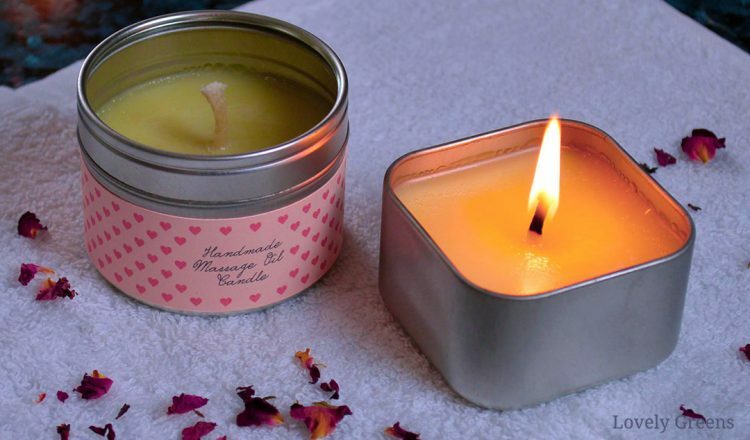 Massage oil candles make great gifts for Valentine’s Day, anniversaries, bridal showers, and wedding favors. Most of the ingredients listed below are in weight and if you don’t have a digital scale, I recommend this one. 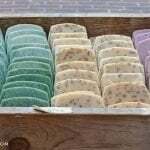 Another thing you’ll need a scale for is making handmade soap. * High IU Vitamin E oil is supplement graded and not the kind of oil you’d find in the drugstore beauty department. It should not be used undiluted on the skin and is used in this recipe as an antioxidant: it helps the oils to have a better shelf life. Skip this part if you’ve purchased pre-made wicks that have sustainers already attached. Cut lengths of wick that when measured from the bottom of your candle container will stick out by 1/2″. The raw wick you purchase should be all-natural fibre and made to burn in soy wax candles. It should also be for candle diameters much larger than your own container so that it burns faster and will create a wax pool in less time than a smaller wick. 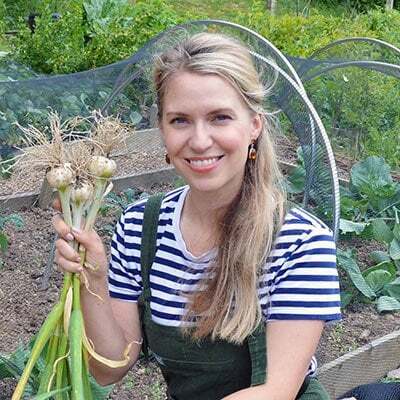 After the lengths are cut, feed the wick through the hole of a metal sustainer using a wooden skewer. The sustainer helps hold the wick in place and you should choose a standard or slightly larger size for this project. Slide it all the way down to the end of the wick so that no wick is sticking out of its bottom. Using pliers, squeeze the metal feed on the top of the sustainer over the wick so that the wick is held in place. Place the butters, sweet almond oil and soy wax in the sauce pan and heat on low until completely melted. It’s better to do this using the double boiler method but you can heat directly on a hob if you keep an eye on it and are stirring the entire time. If you’re using raw wicks that you’ve assembled yourself, place them into the oil so that they can absorb some of it – this will help the wicks to burn cleaner. There’s no need to put pre-made commercial wicks in the oil. When the oils are fully melted, take the pan off the heat and set it aside to cool. Before you add the rest of the ingredients the oil will need to cool down to about 130°F / 54°C. While it’s cooling, continue to the next step. 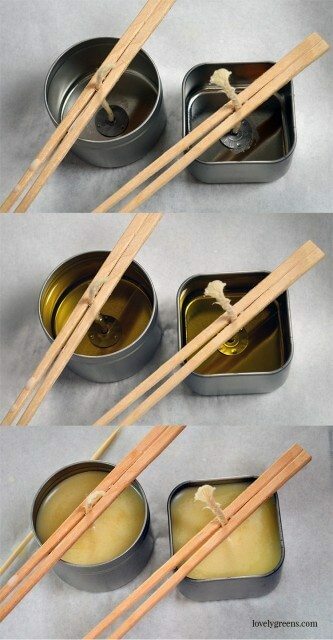 Using the wooden chopsticks, center your wicks inside your containers. If you’ve used raw wick and had it floating around in the oils, fish them out with your spatula and wring the extra oil out. 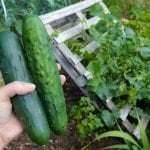 If you touch them with your fingers, make sure that you wear latex or vinyl gloves. 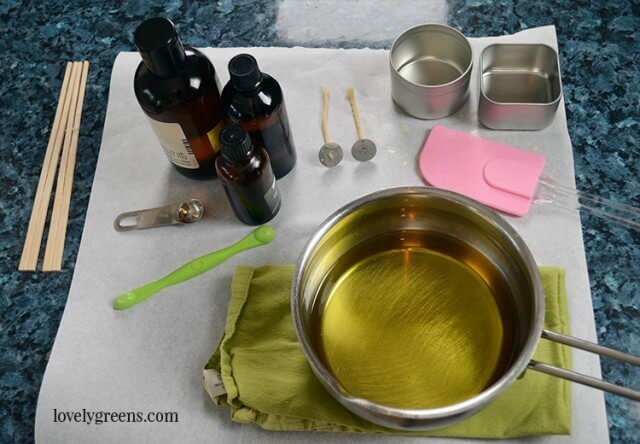 When the oils have cooled down, add the essential oils and the vitamin E and stir well. The blend of Rose-Geranium and Palmarosa is beautifully floral and relaxing. Once the fragrance and vitamin e is blended in, gently pour the oils into your containers using the spatula to get every last drop. If the wick bottom moves around during this time, use the wooden skewer to push it back into place. Leave the candles to sit for at least 12 hours to harden and cool. 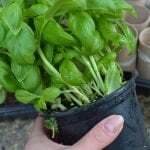 Trim the wick when the containers are no longer warm to the touch and the oils have hardened. 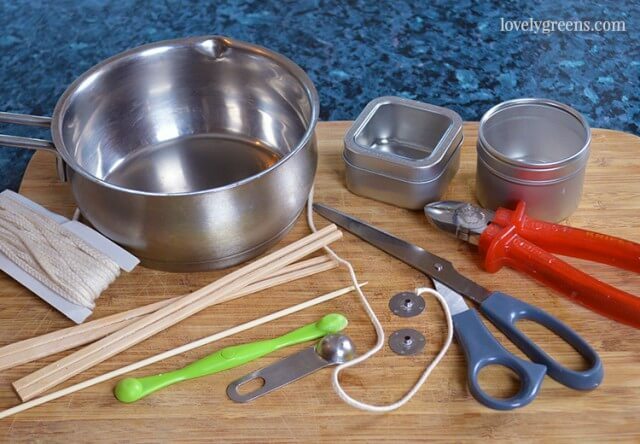 Remove the chopsticks and use a pair of scissors to cut the wick flush with the top of the container. Clean the tins (and lids) with a clean, dry cloth and then fit the pieces together. 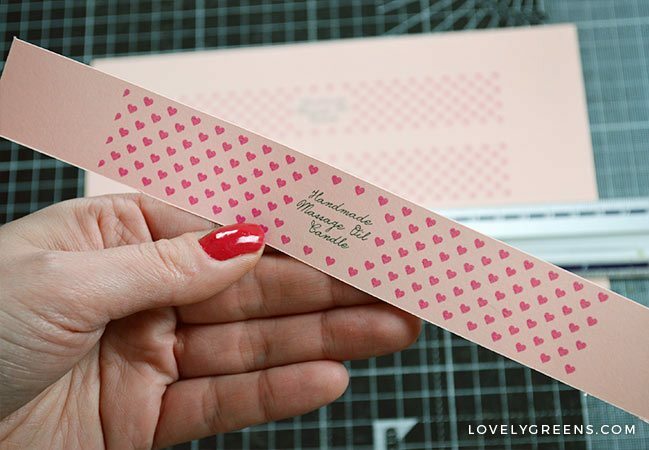 You can decorate it simply with a ribbon or go all out and print labels. The pink label on my tin is printed using this design on a sheet of pink card paper. The labels are 1″ tall and fit around the round tins perfectly. Secure them with a small piece of clear tape. To use the candle, light it and leave it to burn for 5-15 minutes or until a sizable pool of warm oil has formed. During this time the scent of the essential oils will begin to fill the air. Now blow out the flame and pour the warm oil directly into your hand and immediately massage into the skin. The first time you do this you’ll be surprised at just how pleasant the temperature of the oil is. Please be aware that if you leave the candle burning for more than half an hour the tin can get warm. Be careful when picking it up and also make sure that the temperature of the oil isn’t too hot. 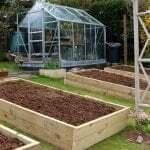 « When should I start sowing seeds? 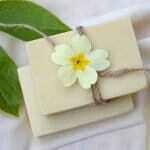 Soy wax is not absorbed into the skin whereas the others are. If you use too much soy then your skin will end up being covered by a thin layer of wax. Hi I was wondering if there is something I can use other than soy wax and get the same results also if I wanted to use other essential oils for different scents would it be the same measurements? I imagine that you could use other types of plant waxes including olive wax, hemp wax, and loads of others. If you end up trying one, please let us know how it goes. Thank you! Another quick one I’m in the US and seem to only find soy wax I did find coconut but it’s GMO my Google searching skills aren’t the best could you offer some direction to where I can find other plant based waxes? Can you use jojoba oil instead of sweet almond oil? You could and it would be lovely, but it would be quite a bit more expensive. You could create a mix of the two though if you were interested. The almond oil in this recipe can be substituted for any other (relatively) light liquid oil such as sunflower or olive oils. Why was the almond oil used along with the essential oils but in a different order? I think I know why but I want to clarify before I start my candle making progress. I’m not sure what you’re asking? All of the ingredients are listed together. Probably so I wouldn’t recommend it. Massage oil provide all benefits of a massage, in the comfort of your home without having to visit a spa or massage parlor. Thus helps save time and money. I’ve always wanted to make candles. Thanks so much for this post! You’re very welcome Minnie 🙂 Keep in mind that these are Massage Candles though — they’re like a hot oil massage rather than your standard candle. Just wanted to drop a note to say, how amazing i think it is that you make your own candles! i have been making lotions and oils but havent dipped my toes into the world of candles before but i have extra materials from bulkapothecary.com/categories/massage-oil-lotion.html so i may just give it a try . either-way Bravo!